Why Yosemite? It's got dozens of incomparable meadows and more than a hundred lakes, plus waterfalls as tall as a 200-story building, trees the size of rocket ships, mountains the size of ... mountains. Yosemite in size is definitely bigger than handful of european countries. Why Hike to Taft Point? It can do funny things to your stomach. 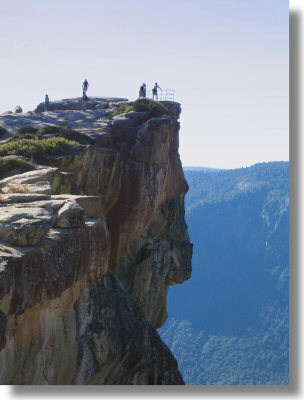 It's Glacier Point without vistas of Yosemite Valley, especially El Capitan. Guaranteed to help you answer the question: Am I afraid of heights or not? And an excellent mildly sadistic people-watching spot, for seeing how your fellow hikers privately answer the same question. We have spent only a couple of days at Yosemite and hence this little blog.